The geography of Vietnam lends itself to one of two routes for exploring. You either go from North to South or from South to North. The flights worked out cheaper to Ho Chi Minh City so that’s where our Vietnamese adventure began. The heat and noise hit us as we left the arrivals hall. It felt strangely familiar, despite never having been there before. We couldn’t get a price we were happy with for a taxi into town so climbed aboard a local bus and whilst the children were free we had to buy a ticket for our large backpack. We trundled through the swarms of motorbikes and were set down somewhere near our hotel. The welcome in HCMC couldn’t have been more different than in Tokyo. “The room you have booked is too small for you and your children.” Oh, here we go again we thought. “I’ll put you in a bigger room for the same price. Your kids are so cute!” I knew then that I’d like Vietnam. 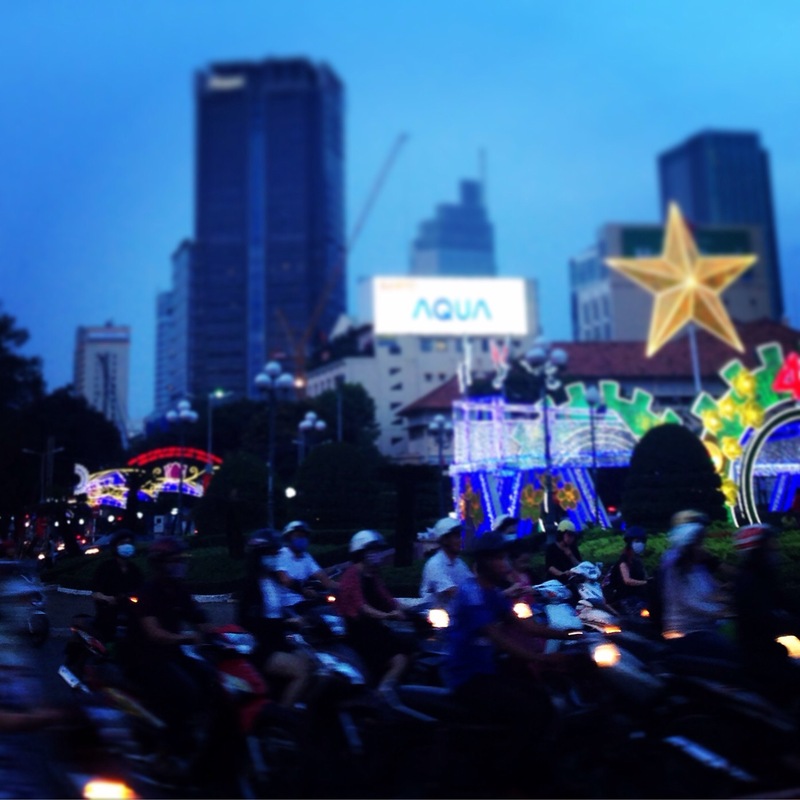 We spent a happy few days in HCMC. My faithful flip flops from Western Nepal gave up on me so we wandered round the market looking for replacements. Everything is fake branded so I am now the proud owner of a pair of Aberconnbies [sic]. There are some cool playgrounds which the boys enjoyed no end. Not least because a random encounter with a lovely family from New Zealand provided them with a playmate for a large portion of our time in Vietnam. We weren’t sure about visiting the War Remnants Museum with children but it worked out really well. They enjoyed seeing the planes and tanks outside and there is a playroom on the top floor. Nick and I meanwhile took it in turns to play with the children whilst the other visited the museum. I walked through the exhibition with tears streaming down my face. I learnt more about the American/Vietnam war and the far reaching implications of Agent Orange. There are some truly horrific photos of the brutality of war, in particular of children, which made me despair for humanity and stayed with me for a long time. Mui Ne is a big draw for Russian tourists so between self catering and all the Cyrillic signs we didn’t really feel as though we were in Vietnam. 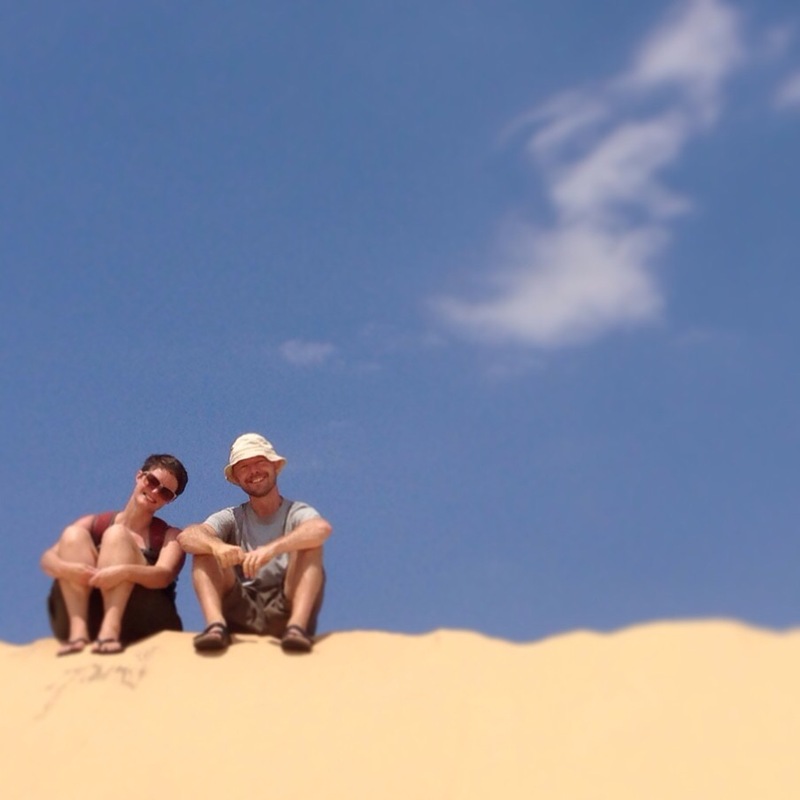 We enjoyed the company of our Kiwi friends who joined us for a few days and all had fun in the nearby sand dunes. The beach was a let down however, as the water was dirty and I was savaged by sand flies. We took to using the pool at Joe’s (a local cafe/resort) where the boys perfected their swimming. After a couple of weeks, feeling rested, we cut our losses and were back on the road. We headed up to the Central highlands and the hill town of Dalat. Enjoying the cooler climes whilst we saw the sites including Hang Nga Crazy House, Elephant falls and the beautiful Xuan Huong lake. Dalat is well know for growing vegetables and the surrounding countryside is covered in poly tunnels. We had planned an overnight trek with camping at nearby Mount Langbian. The start of the trek was rather disappointing with lots of rubbish and noise from jeeps. However after a steep climb we were soon away from the busy tourist area and horses painted to look like zebras. The next part of the walk was really enjoyable as we ambled through lush pine forest, even Tom managed the whole thing without complaint. As we got to the top the clouds had rolled in and we seemed to be right inside the peals of thunder. The heavens opened and we got soaked to the skin on our way down the mountain. Slip sliding on mud and trying to avoid the torrents that cascaded down the path next to us. At one point I had a couple of kilos of extra weight in clay stuck to my feet. We decided we didn’t have anything to prove by staying in the tent and beat a retreat to the warm shower in our hotel. From there we hit big brash seaside town of Nha Trang. The beach was lovely, if crowded and the boys loved jumping off the diving board at the Central Park pool. We attempted the ‘Total Wipeout’ style bouncy stuff in the sea, but didn’t really get the hang of it. It was a good place to break up the journey northwards but boy were we happy to reach Hoi An.